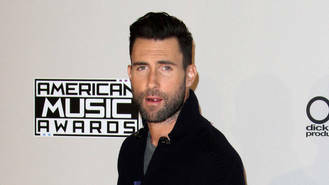 The Maroon 5 singer was joined by his bandmates and wife, model Behati Prinsloo, their four-month-old daughter Dusty Rose, plus celebrity pals Blake Shelton, Gwen Stefani, and Sammy Hagar as he was honoured in Los Angeles on Friday (10Feb17), and he confessed he was blown away by his new star. "I'm not going to downplay this and pretend that it's not the coolest thing ever that this is happening," he told fans. "I'm from Los Angeles, California. My band is here. We just had our 23rd anniversary playing music together. We were 14 or 15 when we started this band. I was cocky, I thought we'd be successful but this is so f**king nuts. "This is a surreal, exciting and astonishing moment to be experiencing. It's really incredible. I have a daughter. I have the most beautiful wife in the entire world. I am one of the luckiest people who's ever lived. This is one of the most incredible, special days of my life." Country star Shelton also stepped up to salute his pal and he unveiled the 2,601st star on the Hollywood Walk of Fame, calling Adam "one of my best friends". "Adam and I have been on an incredible journey together," he added. "We have both seen some ups and downs. I've seen a lot of ups and downs and I've never had a more honest and loyal friend than Adam Levine." He then joked, "Nobody is more shocked, I mean proud, than I am that's he's going to have a star on the Hollywood Walk of Fame, forever." Former Van Halen singer Hagar also offered a few words, calling his new tequila brand business partner "probably the most unaffected superstar I've ever met." The rocker added, "He has a new baby and all of a sudden he's just awesome. He can change a mean diaper... that's special."